After arriving at Stetson from Celebration High School in Kissimmee, Florida, Darash Desai didn’t want to stay. Desai was a first-generation immigrant who grew up squarely focused on math and science and without an idea about liberal arts education. Desai had been wait-listed for admission by several top-notch institutions of higher technical learning, including Stanford University and M.I.T., and conceded that he wound up on the DeLand campus only because a teacher from high school made the last-minute suggestion. He even used the word “desperate” to describe his intent to transfer early, adding that he actually sought out Stanford a second time, a request that was denied. Desai told the story only a handful of hours before he would stand up in front of a vibrant crowd at the Edmunds Center as Stetson’s 2018 Convocation speaker. Stetson Convocation, held Aug. 22, marked the formal opening of the 2018-2019 academic year, with classes commencing the next day. The new academic year welcomes approximately 900 first-time-in-college students and 110 transfer students — Stetson’s second largest incoming — who join some 2,100 returning undergraduates. In all, Stetson has an estimated 4,300 students, including graduate students and students at Stetson University College of Law in Gulfport. An annual tradition, Stetson Convocation is filled with pageantry. Many of them were in attendance at Convocation, gathered together for the first time. And, in keeping with tradition, there was a colorful processional of campus dignitaries and class representatives along with ample pomp and circumstance. On stage, Desai’s messages were similarly stimulating. 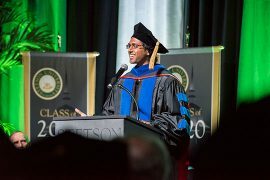 He began his Convocation address with: “Stetson has played an incredible role in where I’ve ended up today – a senior researcher in global health innovation at one of the leading engineering institutions in the country.” He then when on to tell his story, one of initial unease that steadily turned into opportunity, engagement and triumph. Those actions, he explained, simply were the result of “opening up” — exploring, inspiring others and challenging oneself. Regarding the idea of challenging oneself, Desai said he was forced out of his comfort zone at Stetson. Yet, while courses such as Foundations of Knowledge, Self and Society, and Justice and Ethics were “alien” to him, they strengthened his ability to think critically. “I learned to challenge the things I took for granted, dissect my own beliefs and, in the process, got to better know myself, what I wanted and what I stood for. That ended up having a pretty profound impact on my trajectory,” he shared. At Stetson, Desai concluded, he discovered himself. Today, his work at Boston University is multipronged and focuses on the design and development of need-based global health technologies that deliver social impact in low-income countries. His doctoral work had centered on the development of PharmaChk, a portable medicines-quality screening tool. Those efforts now are being expanded. In essence, Desai is helping to ensure that medicines worldwide actually work, particularly in the countries of greatest need. It’s a long way from Stetson but apparently not far from lessons learned.